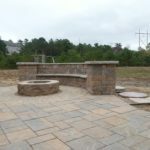 With the creation of modular units, a stone fireplace can built quickly and easily and sizes can be customized to fit any outdoor living space. If you are looking to match your concrete pavers and wall block, many of the manufacturers today have fireplace units that will fit perfectly with their other products. A fire wall is a unique combination of a fireplace and wall. These units incorporate a propane or natural gas burner, eliminating the smoke commonly associated with fireplaces. They not only provide superior heat to a fireplace, but create a privacy screen or separation between elements of your patio. 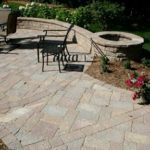 With the continued development of gas inserts, fire can be added to almost any element in your outdoor space. 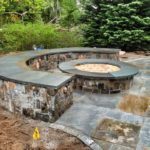 Whether it is along the top of a wall, into the counter top for your outdoor kitchen or table, or even a natural stone boulder, we can create a fire feature to match your exact vision. What are the building/ State requirements? A minimum of ten foot clearance between and outdoor fireplace and combustible materials. Vent stacks, chimney and chimineas shall have a steel screen cover made of heavy wire mesh. Size of the fuel area shall not be larger than 3’ in diameter and a height of no more than 3’. 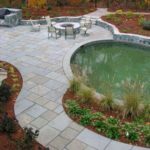 Outdoor fireplaces shall be placed on a stable, non-combustible surface such as a concrete pad and only at grade level. Burn untreated wood or approved fireplace starter logs. Limit the amount of material being burnt to ensure the flames are confined inside the fuel area. 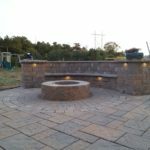 When we are creating your custom outdoor fire feature, we will ensure that all local requirements are met and work with you and your local governing authorities to ensure your project goes smoothly. 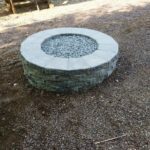 Do I need a building permit for creation of my custom fire features? When building an outdoor fireplace or a unit with a permanent connection to natural gas or propane a building permit is required. In most cases, a fireplace over 6’ tall requires a building permit. 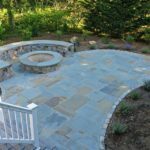 Contact Sheridan Landscaping for a free estimate on our outdoor fireplace designs and installation at (774) 413-5012 or fill our contact form to get immediate assistance.